SAGE India Digest: What is the reason of decline in rural female workforce despite a discernible improvement in India’s rural economy in recent years? What is the reason of decline in rural female workforce despite a discernible improvement in India’s rural economy in recent years? The role of women in the socio-economic transformation of a country is now globally recognised. Though some national governments have taken affirmative action in the past few decades to improve the socio-economic status of women, those living in rural areas, especially in developing countries, continue to be marginalised and underprivileged for several reasons. Empowerment of rural women refers to a situation in which women living in rural areas have adequate, independent and equal means of livelihood and other economic, social and political opportunities for growth and upward mobility. Empowerment of women is a necessity for improving their status in society and therefore women’s access to economic and financial resources is vital for their empowerment. While India’s economy has grown over the past few decades, its female workforce participation rate (WPR) is registering a decline. In 2012, Indian women comprised 27.37 percent of the country’s economically active population. Out of these, 60 percent worked in agriculture, accounting for 35 percent of the agricultural labour force. The contribution of women in farm production is estimated at 55–66 percent of the total labour force. Women by nature take on domestic household responsibilities, but such gender roles limit rural women’s participation in labour markets and confine them to lower paid and relatively precarious employment conditions. Particularly in rural areas, women face discrimination in accessing resources and services needed to improve their productivity, such as access to credit, secure land titles and education (FAO, 2011). If women can access the same productive resources as men, they can boost farm productivity significantly. The falling female WPR in India can be due to various reasons. These include what is known as the income effect––as household income rises, women start withdrawing from agricultural activities––low education enrolment; a lack of job opportunities and uncertain forms of measurement––it is difficult to accurately gauge the participation of women in work because of the nature of their jobs––home-based work, subsistence agriculture and so on. 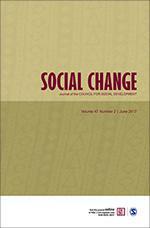 Against this backdrop, this article from 'Social Change' aims to examine trends, patterns and drivers of female workforce participation in rural India, captured through the lens of migration, social and religious factors, land rights, agricultural income, education and wages.